What’s good, everyone? Thanks for all the comments and encouraging words for my last wash day post. 😀 After my last wash day, I knew I wanted to protective style my hair. I need to give it a rest for a bit. My options were braids, weave, or a wig. I decided to go with a wig because it has little to no pulling. I did this wash about 10 days ago. I want to see if I can handle washing every two weeks and reduce the amount of manipulation. Hopefully, my scalp can handle it. Here’s what happened. (1) Detangling and Pre-poo: Sectioned my hair into 6 and applied the Shea Moisture elixir to each section. I used my fingers to detangle and get out any major knots. Then, I applied Motions Moisture Plus conditioner to each section, wrapped my hair and used my heating cap for 15 minutes. My hair was quite soft after using the conditioner. I was surprised because I didn’t really like the conditioner when I used it in the past. After using my heating cap, I detangled each section with my wide-tooth comb. (2) Shampoo: I washed each section twice with Creme of Nature Argan Oil Shampoo. (3) Deep Condition: I used Creme of Nature Argan Oil Intensive Conditioning Treatment mixed with Lavender JBCO and jojoba oil to deep condition with heat for 30 minutes. (4) Leave-ins and Styling: After rinsing out the conditioner and t-shirt drying for about 10 minutes, I applied Giovanni Direct Leave-in and African Naturalistas Leave-in Conditioner to each section. I sealed each section with my oil mix (hemp seed oil and coconut oil) and detangled each section. Detangling went so much better this time. 😀 I allowed my hair to air dry slightly (~50%) and I roller set my leave-out and braided the rest using box braids. 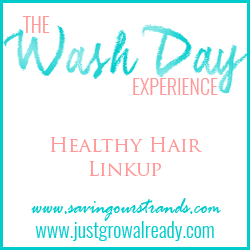 This wash day was very simple and fast. For that, I am grateful. The next day, I took down the rollers and put on my wig. I used the wig I got from Hair by Type 4. The wig is quite durable. My major concern is my leave-out hair. It’s in the front, which is the weakest part of my hair. I’m worried about breakage and manipulation. To maintain it, I moisturize every other day and use my castor oil mix on my scalp. I want to keep wearing this wig for another 4 weeks and then switch to another one. I have the Creta Girl wig which I’ve only worn a few times. I was having issues blending it but I’ve been inspired by some YouTube videos. Hopefully, I can get to look okay. Glad to hear your detangling session went smoother, good luck on recovering from your setback! I feel you on having a leave-out with a protective style, however it seems like you have a good plan to take care of it. Protective styling is always good. I think every two weeks should be okay with your scalp. I have also been protective styling with a wig for almost two months now. I have washed my hair 3 times and I haven’t had any issues. Thanks, Keoshia. My scalp feels pretty good so far. Two weeks seems to be the max for me if not my scalp screams, but you can try longer and see if that works for you. Hi-five for easier detangling chica! I think that hiding your hair until you have the mindset to deal with it again is a great idea! Shoot—I might even join you! Thanks, KLP. Divachyk and Jeni are doing the 30 day protective style challenge. I’m looking forward to reading all the results. I’ve been using Motions Moisture plus conditioner since I started my hair journey and I’ve never had a reason to complain. The conditioner is amazing. Lol! Giving your hair a break is the best thing for your hair right now. I’m also thinking of wigging but my attempt at a DIY wig failed so I may have to invest in one like you. You are far better than me. I won’t even venture to try and make a wig. Mainly because I think it will fall apart.